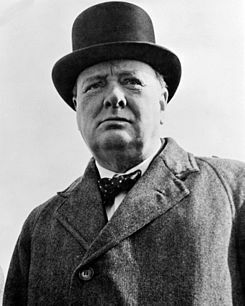 Sir Winston Leonard Spencer-Churchill, KG, OM, CH, TD, PC, DL, FRS, RA (30 November 1874 – 24 January 1965) was a British statesman who was the Prime Minister of the United Kingdom from 1940 to 1945 and again from 1951 to 1955. Churchill was also an officer in the British Army, a historian, a writer (as Winston S. Churchill), and an artist. He won the Nobel Prize in Literature, and was the first person to be made an honorary citizen of the United States.